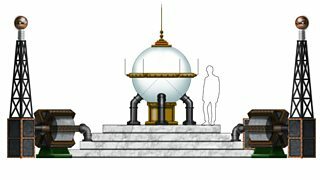 Michael Pickwoad is the Production Designer on Doctor Who and in part one and part two of our interview with him he discussed the inspirations and influences behind his design of the new look TARDIS. Question: What’s your favourite element of the new TARDIS interior? Michael Pickwoad: This has to be the contra-rotating time rotor. It came to me when realising that all TARDIS have had a large circular feature above the console, which never actually did anything. By making it revolve it would suggest that it was computing the time co-ordinates and setting the course through time. Looking at the revolving tray in a microwave suggested the idea that if each ring supported the next on wheels fixed to the centre, then by turning one ring, the next would revolve in the reverse direction and give more of a sense of computing and conjuring up the idea of a circular slide rule. Each ring of the rotor is divided into eighteen parts, complimenting the eighteen ribs of the TARDIS structure, and being finished in silver and furnished with Gallifreyan symbols, adds to the sense of precision. Q: And finally, aside from the new TARDIS, what was your favourite set in the Christmas Special? MP: The Christmas Special had several lovely sets. The Latimer House was a beautiful location, Dr Simeon’s GI Institute with its Snow making machinery allowed for great imagination, based on 19th Century electrical experiments, but probably my favourite was the London Street with the back of the pub, based on a wonderful 16th Century building in Oxford, where I live. One the enjoyable things about ‘Doctor Who’ is the great variety of sets and locations and they all require the same attention. So the London Street had to be worthy of a costume drama and match with the charm of the period Bristol streets where we filmed some of the scenes. Don’t forget you can watch a clip featuring the new TARDIS interior and we’ll be seeing more of it when Doctor Who returns on 30 March, 2013!